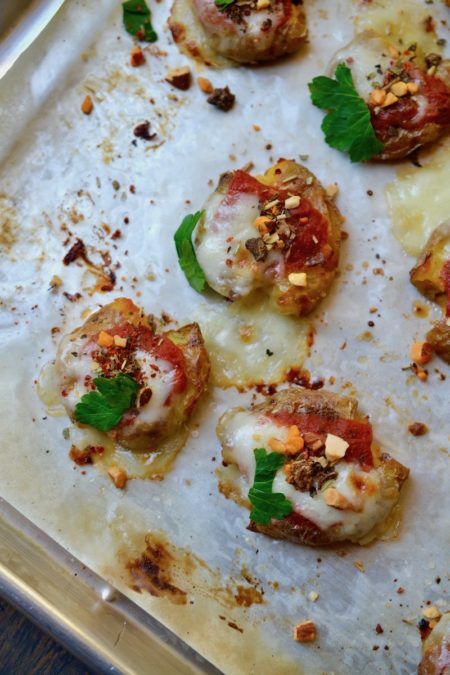 An Italian twist to an old favorite – potato skins. This Mozzarella Potato Bites Recipe makes a delicious tasting appetizer and can be quite addicting for your guests. They’re the perfect little finger food for watching the Oscar awards, basketball game gatherings, or any fun get-together with friends. Using only a few, simple ingredients, these Mozzarella Potato Bites are easy to make for the inexperienced or novice cook or the I-don’t-like-to-get-into-the-kitchen cook. And to make things even easier, take the shortcut and prep the potatoes the day before so they are ready to smash and throw into the oven when the guests arrive. The most difficult part of this Mozzarella Potato Bite Recipe is finding the perfect little potato. Any type of small potato will work, but a fingerling or other type of very small potato, these I found at Trader Joe’s, work best. I bought ready-made, good quality marinara sauce and a block of fresh mozzarella cheese which I sliced into small pieces to top the potato. And finally, these tender little potato bites are topped with crunchy deliciousness from our Glory Kitchen Umbria nut & spice mix. It adds the perfect flavor of garlic, onion and almond crunch. Here’s a warning – make plenty because they’re always a big hit and are likely to disappear quickly. Bring a large pot of salted water to a boil. Add the little potatoes and allow them to boil until they become soft and a fork can pierce through easily. Remove from the heat, drain, and allow the potatoes to cool. Place the potatoes back into the same pot (since it is already used, you won't have to get an extra bowl dirty), drizzle the softened & cooled potatoes with olive oil and sprinkle with sea salt. Using your hands, toss the potatoes so they are lightly covered with olive oil. Preheat the oven to 400°. Using a parchment or foil lined baking sheet, arrange the lightly oiled potatoes onto the sheet and with the back of a coffee cup or other small flat surface (a small plate, small pot, etc. ), smash each potato so it is cracked and somewhat flat (see photo). Place the sheet pan of potatoes into the hot oven and bake them until the edges are brown and crispy. Remove from the oven. Layer each crispy potato with a spoonful of marinara sauce then top with a small slice of mozzarella. Add a good pinch of Umbria nut & spice mix and a sprinkle of sea salt to the top. Place back into the oven, this time on broil, and heat just until the cheese on top melts. Remove from the oven, sprinkle with fresh herbs and serve immediately. These potato bites are so tasty they disappear quickly, so make plenty. Although I used chopped, fresh parsley to top the potato bites (because that is what I had on hand), I think fresh slivers of basil would be even better!